Brighton & Hove Albion keeper Mathew Ryan helped Australia qualify for the knock-out stages of the Asian Cup this afternoon. The Socceroos scored an injury-time winner to beat Syria 3-2 to finish second in Group B. They will now meet the runners-up of Group F, Uzbekistan or Japan, in the last 16 on Monday. They have both won their opening two games and meet to decide who will be crowned Group F winners on Thursday. Australia lost 1-0 to Jordan in their opening group game, before overcoming Palestine 3-0 in their second match. Jordan drew 0-0 in their final match to finish with seven points from their three matches. 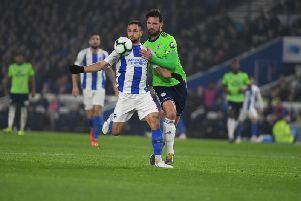 If holders Australia make it all the way through to the final on February 1, Ryan will miss the Seagulls' next four matches - at Manchester United, the FA Cup tie with West Brom, away to Fulham and at home to Watford. Ryan's Albion team-mate Alireza Jahanbakhsh is with Iran at the tournament. The winger is yet to play in their opening two games after suffering a hamstring injury in Brighton's match at Everton in November. Iran are already through to the knock-out stages after wins over Yemen (5-0) and Vietnam (2-0). They play Iraq tomorrow to determine who will win Group D.